I may be prone to baby face, but nothing seems to protect me against near-tragedy underneath my eyes. I often wake up puffy, even after a good night’s sleep and no alcohol. Lately, as some sort of icing on the cake, I’ve noticed the skin under my eyes is appearing darker than usual. So I’ve been on a month’s long mission to correct this issue. Against the better judgment of my boyfriend not to self-diagnose, I bought some iron pills from my local health food store in an attempt to correct the anemia I may possibly have again, thanks to those dark circles. After a few weeks, I realized it wasn’t an iron deficiency that was causing the darkness. I then was stuck on the fact that my paleness had to be contrasting with the delicate skin of my under eyes. But the darkness seems like a recent issue and my paleness has been around for many years. Maybe it was time I finally invested in a legitimate under eye cream. 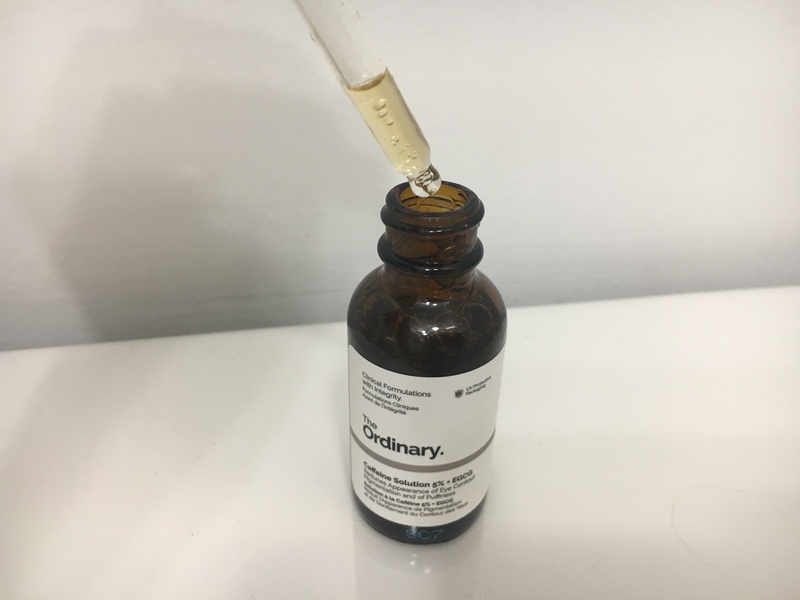 One of my best friends and beautiful model/actress recommended The Ordinary’s Caffeine Solution 5% + EGCG after reading a rave review from a big time beauty blogger and purchasing for herself. The price of this serum absolutely sold me. It was either this or the only other recommendation I could get- a $300 eye cream that sounded incredible but was outrageous in price next to the $6 it costs to have this one from The Ordinary. I mean, $6?! Are they insane? I did end up having to pay $5 in shipping to get the serum to my door, but even at $11, I was still blown away. My friend who has gushed about this product for months, who is stunningly beautiful and whose designer bags are NEVER under her eyes, convinced me I had nothing to lose (except for the equivalent of two cups of coffee) and potentially everything to gain. I’ve just updated the status of this qualification to a ✓ because it’s finally no longer sold out on Sephora.com. However, two weeks ago it was very unavailable and so I was sent to Deciem, “an umbrella of good beauty brands” that is still experiencing high volumes of orders. It’ll most likely take you about 10 days to receive this product as it did for me. I’m a sucker for labels. If I ever bring a bottle of wine to your house, I can’t guarantee it’ll be delicious but I can ensure it’ll be pretty. Luckily, The Ordinary Caffeine Solution fits into my favorite clean aesthetic. The medicine topper lid makes it super easy to drop a dollop onto your fingertip and the bottle is perfectly small for any toiletry case or handbag. I like that this product comes in serum form as opposed to a cream, feeling like it can really be absorbed into the skin and better penetrate pores. After one morning and one night application the skin under my eyes felt silkier and softer, as if it was brushed in a sheen of satin. I wanted to give it at least a week before offering a full review and now, 8 days later, I can honestly say that the skin under my eyes is less dark- for sure. My eyes have not been puffy at all. They aren’t usually puffy everyday, but they would have been at least once during this 8 day period and since applying a tiny dot every night, they have been smooth as can be! As far as I can tell, the Caffeine Solution +EGCG (a green tea derivative) definitely works. When considering the unbelievable $6 price tag, the ease of application, and the surprisingly effective results, I can say with certainty that this product is absolutely worth it! Will you give it a try?